This is sweet and bitter love story of Dejiko who is a grown up. The story begins on the Christmas day. Dejiko or Di Gi Carat is working part-time at a bakery shop. On her way from the shop, she happens to meet a young guy, Senba Taokuo at a park. Then, she meets him again in a town. While Dejiko begins to care for Tako and she’s looking forward meet him again, Takuo drops in at her shop.... Whether will she succeed in love? As you might know, this is a spin-off from Di Gi Charat, which I have never seen or read about in any great detail, so there is some stuff on which I just can't comment or write enough detail about. Not the strong point. The colours are simple, without any gradients used. The backgrounds are simple as well, but nicely drawn. The character designs are quite simple too, but they are cute. The notable thing is that as soon as there many characters on scene, like crowds, they are just drawn plain white with black lines. Something that doesn't actually ruin the animation in any way, or doesn't annoy the person watching it. Running animation is I think one of the better points. Sometimes there is a chibi scene thrown in, but they are done fairly well and are not annoying in any way. Overall the animation is poor, but I don't think it's a factor that affects the overall rating by much, but I was expecting something more complex than this. This special features quite a nice OP and ED, and fairly good background music, which is a bit on the simple side. There is also a French song in the second episode, which is quite good as well. Since this is only two episodes long you can't expect anything complicated. It's a simple story about a girl who meets a boy. An unexpected encounter which starts off everything, and a misunderstanding as well to create some drama. It's a rather light and sweet story. Considering the fact that they had only two episodes I think that it was done quite well, with a good conclusion. Well, I have seen a fair amount of anime, and I decided to pick up this little special after seeing random videos of it that piqued my interest. Anyway, I'm very glad that I did. If you don't want to read the whole review, the bottom line is this anime is very much worth watching, regardless of its score, and also that you don't need to see the main series to enjoy this special, as I saw this first. I've seen better scored animes which I didn't enjoy quite as much, so take that with a grain of salt, not to mention this review. The story is a typical anime romance scenario, except the beauty of this special is that they manage to fit so much action into two episodes and make it work extremely well and make you wish it were longer (at least in my case). But the story doesn't really leave anything unanswered, so if you're a perfectionist like me that has to have closure on everything, you won't be disappointed. Well, what can I say, really? It's Japanese animation and it's quality. some of the scenes seem to be low detail in the distance but it's the style of the anime and it works well. I didn't find any part of it to be really lacking. The colours are bright and easy on the eyes, and everything looks very nice. Well, there's not a whole lot of songs to the anime, being short, but what it does have is superb. This is the quality of Winter Garden that made me want to watch it, which is surprising because I tend to go for anime for the story, but that's okay. The sound is very good. Well, there aren't many characters, but they are introduced quickly and everything develops nicely and you never really forget any character's name because they are all important in this anime, there are hardly any &quot;minor&quot; characters. This is another thing I love about this special. The plot in this anime is very well constructed and keeps you on the edge of your seat till the very end (or at least it did for me). For only 2 episodes, you get plenty of bang for your viewing buck (please excuse the overused idiom, I couldn't find anything much better to use here). But I really did enjoy this anime. It is one of the best ones I have seen despite being short and is worth watching. If you haven't seen this yet, I would highly recommend doing so sometime. You probably won't feel like you wasted your time, and with only 2 episodes, you're not risking much anyway. I would recommend this anime to anyone who likes romance-driven plot and interesting characters. What felt like 26 episodes was flattened into 2 I was in the zone when I saw this series. It was like riding a roller coaster during Christmas. Magical... Literally I could not blink because I would miss so much... This series was amazing! Di Gi Charat - Winter Garden is a warm and lovely title where you don\'t need to be familiar with Di Gi Charat series to enjoy it and/or understand it. Its not a direct sequel so anyone can randomly pick it up and enjoy it. Basicaly the story evolves around Digiko and her love with Takurou Senba. Their love is not considered &quot;love at first sight&quot; but it\'s seen as more of a developing relationship from a first sight encounter. 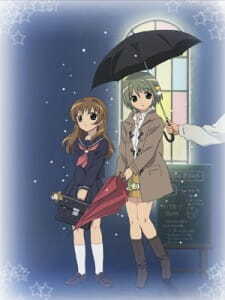 With some dramtic and comedy moments, this love story isn\'t easily forgotten even though it span through 2 episodes. In conclusion, recommended for anyone into the romance genre. Its a very cute and romantic title where it could have easily extended in a 12 episodes series if they remade it again. Poll: Will there be a sequel? 20 Best Christmas Anime: Which will you ask Santa for this year? Ho ho ho! Merry Christmas! The holidays are getting closer and closer, which means that it is time to check out some good winter-related anime series to guarantee you a heartwarming holiday experience! Let's take a look at 20 of the best Christmas anime available that even Santa would approve of!